Before you start playing it is pretty obvious that you need a harmonica. Typically what you need if you play blues is a diatonic harmonica. This is the 10-hole version that is quite common in blues, rock and among troubadoures. Some people think this instrument is a toy but nothing could be further from the truth. Diatonic harmonicas from serious brands are serious instruments but suprisingly cheap compared to other instruments. There are a few things you need to know before shopping around for your harp. This article aims to give you a good start. For full disclosure, the links in the article are affiliate links and I get a comission if you choose to buy through these links, thank you for your support. First of some basic stuff, what you are looking for is a Richter tuned, major diatonic harmonica. Most often you can leave out the “Richter tuned” part when you search for a harp but you want to be sure it is a major diatonic. Most diatonics are major diatonic. Some brands offer other version such as melodic minor and harmonic minor variants. These are more suitable for playing folk music and melodies than blues. OK, so now you know the type of harmonica you need, another thing to decide is what key to choose. The key of the harmonica is which scale the harmonica is tuned to. A C-major diatonic harmonica is tuned to the C-major scale. It is basically a small piano with the black keys removed (and a few of the white keys as well). So what key to pick then? First off, it doesn’t matter what key you use when you play by yourself and learn to play. All keys work the same way. However if you play with other people you need to be in the right key. If you choose a harmonica that is tuned to a very low key it can be more challenging to play at first. Very high pitched harmonicas can also be challenging to control. What you want in the beginning is key somewhere in the middle of the range. Traditionally G is the lowest key and F (or possibly F#) is the highest key. Nowadays many brands offer keys outside this range such as low F, or even down to low low F. I would recommend a C-major harmonica to start with. This puts you in the middle giving you a very workable harmonica without “extra” challenges. Also a C-major harmonica when played in 2nd position is in the key of G which works reasonably well for most guitar players. 2nd position is what you normally learn first. If you choose to buy more than one harmonica I would recommend an A-major harmonica as well. This plays in the key of E in 2nd position and is also a nice key when you play by yourself. In fact if you get the following keys you are pretty much set for most situations: C, A, G, Bb, low F and D.
So, now you know what type of harmonica and the key to buy so now we have to choose a brand. There are a lot of brands out there and in the end it comes down to what you like and what suits your playing style. I make these recommendations based on my own preferences and what I use and have used. If you ask somebody else you may get other recommendations. One thing though, you basically get what you pay for. A cheaper harmonica tends to be less durable and in some cases not as well set up out of the box. The list below is in order of preference from my point of view. Generally speaking I recommend Hohner, their harmonicas have been the standard for many blues players for a long time. This is no accident, other brands may have gained ground at Hohner’s expence during the last few years but for me Hohner is still my choice. Hohner Special 20 is a plastic comb version of the popular Marine Band harmonica. It is a great beginner harp as it plays well out of the box and is very maintanable. The plastic comb makes it easy to clean and does not swell when getting wet. Many people who start playing these never change to more expensive models. If you are looking for an affordable, durable, maintanable, well setup harmonica with an OK tuning, this is the harmonica for you. The Marine Band Deluxe was the Hohner flag ship product for a number of years, it is an updated version of the classic Marine Band with a better sealed comb and reed plates that are screwed on rather than nailed. They play very well out of the box and also lend themselves well for repair work and custimization. The tuning of this harp works very well for blues and the chords are beautiful. The Crossover is an updated version of the Marine Band Deluxe with even higher precision and bamboo composite comb that does stands up very well against moisture. As with the delux it is very maintainable and plays lamost perfectly out of the bos. The tuning is slightly different so the chords are not as smooth compared to the delux but it works over a wider range of keys and may therefore be a better choice if you not only play 2nd position blues but other styles and positions as well. Before Marine Band Deluxe and Crossover this was the go-to-harmonica for many blues players. An often copied harmonica and for good reason. It works very well out-of-the-box. It has a partially sealed pear wood comb. You may experience som swelling of the comb with this model which is a draw-back. It is not too bad though. The reed plates are nailed to the comb which makes maintenance of this model a bit more cumbersome. The three harmonicas above are far from the only options but reallt what I prefer. Here are some other options to consider if you either don’t like these three, prefer platic combs or can’t get hold of them for some reason. 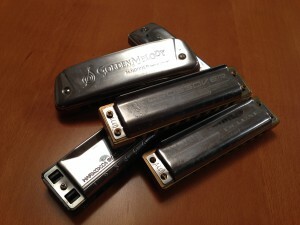 Hohner Golden Melody is a nice harmonica that is a bit thicker, it plays very well but is tuned to equal tuning which works better for melody playing so chord heavy music is not its strong point. Hohner Pro Harp is a plastic comb harmonica quite close to the Marine Band Classic but very maintainable as it is part of the Hohner MS system. Lee Oskar is a very custimizable and maintainable harmonica with lots of spare part options. They work better for melody heavy music due to their tuning. C.A Seydel & Söhne 1847 Classic is a really good harmonica that feels semi-custom to begin with. The only draw-back is that it is a bit pricey. There are other brands out there and advanced players sometimes opt for custom harmonicas but that is a topic of its own. This entry was posted in Harmonica gear and tagged beginner, buying harmonicas by Fredrik Hertzberg. Bookmark the permalink. If I remember correctly, Lee Oskars are based on Tombo. I don’t use Lee Oskars anymore but I know many who really like them. Glad you found harps you are Happy with. Being a complete novice about harmonicas but as a guitar player who wants to play the popular Beatles songs with harmonica parts – within a limted budget- should I buy a ‘starter set’ of 5 or 7 that I see for sale? If so which brand? Or Just 1 or 2? What types? I normally recommend that you buy one harmonica at the time that cost a little bit more. It will serve you better as you get better at playing. A good choice is the Hohner Special 20 which is very good value for money. A C is normally a good chopice but it depends on which key you need of course. If you want to get a set to have more options and don’t want to spend too much I think the Hohner Blues Starter Set is a good choice which should cover you for most songs. It contains seven harmonicas for a little bit more that twice the price of the Special 20. They are of course not of the same quality though. Also the E and the F in the set are high pitched harmonicas that are a bit harder to play well and you may not used them as much. You will most likely use the C, D, G, A and Bb harmonicas more. I hope you find this helpful and don’t hesitate to contact me if you need more advice!